Spicerhaart Part Exchange and Assisted Move (PX-AM) is expanding into the south west with a new business development manager and contract with Linden Homes South West. Leaseholds were initially implemented for flats and apartments with shared facilities, but in recent years there has been an increase in selling leasehold new-build houses, and there are now around 1.4million in England. It’s no secret that there is a housing crisis. It has now reached such a critical point that we need to build at least 250,000 new homes every year to get anywhere near close to meeting the ever-growing demand. And while we are all aware of the need for thousands of new homes, what we do have a problem with is houses popping up on our green land when we can patently see run-down sites across the UK that are not being utilised. 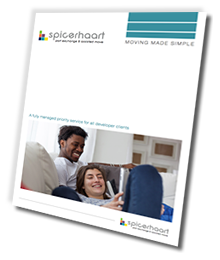 According to research from Spicerhaart Part Exchange & Assisted Move, around half of all pensioners are considering downsizing to release equity from their homes – that’s around 5.7million people. However, due to stamp duty, estate agency fees, surveys, legal costs, removal fees and refurbishment costs, they could ‘lose’ up to £29,000 on average doing so. When it comes to building houses in 2018 there is one thing for certain, you can’t build them quick enough. The government has set out ambitious plans but, ultimately, it’s down to developers to build the homes the country needs.